The Progressive Corporation has offered insurance products to consumers since 1937 and is currently estimated to be the fourth largest private passenger automobile insurer in the United States. Progressive trails State Farm, GEICO, and Allstate and has overall market share of approximately nine percent. 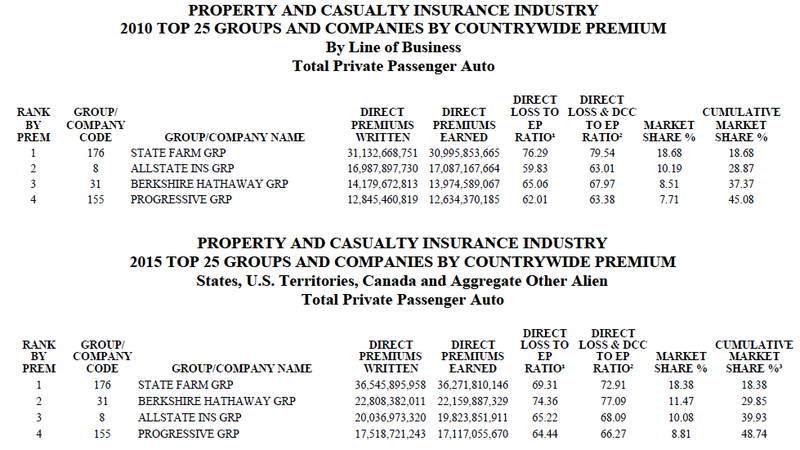 The private passenger auto insurance market is highly concentrated with the top four competitors accounting for nearly half of premium volume. Despite the concentrated market share, competition has become increasingly fierce and transparent due to readily available online pricing. This article takes a brief look at Progressive’s position within the overall auto insurance market. Although Progressive has recently diversified into other types of property insurance with its acquisition of ARX, the vast majority of premium volume is still derived from auto insurance. GEICO, a subsidiary of Berkshire Hathaway, has long been Progressive’s most aggressive competitor. Both Progressive and GEICO have gained market share over the past five years with GEICO overtaking Allstate as the second largest auto insurer. The exhibit below shows data for the top four auto insurers compiled by the National Association of Insurance Commissioners for 2010 and 2015. We can see that State Farm and Allstate have grown roughly in line with the overall auto insurance market with GEICO and Progressive picking up market share at the expense of smaller players. Taking a longer view specific to Progressive, we can see from the exhibit below that the company has increased its market share dramatically over the past two decades rising from 1.5 percent in 1993 to 8.8 percent in 2015. 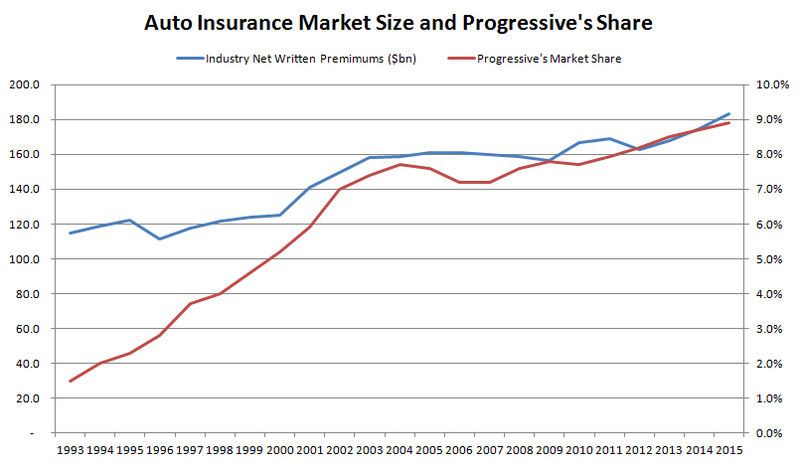 During this period, the overall market for auto insurance has grown at a relatively subdued pace so the bulk of Progressive’s success has come from taking market share from its competitors. The data contained in the exhibit were reported in Progressive’s 10-K reports for each year. Why has Progressive been able to gain market share over the years? Auto insurance is a product that nearly all drivers in the United States are legally required to purchase. However, it is a cost that hardly anyone feels good about incurring, at least until a claim is made. As a result, consumers can be very price sensitive when shopping for insurance. In the past, most consumers obtained insurance quotes through independent agents and gathering competitive pricing data was time consuming. A true apples-to-apples comparison for auto insurance must keep all variables, such as the deductible amount, constant when looking at the offerings of various insurers. The level of service provided in the event of claims is a factor that insurers use to try to differentiate their products, but most consumers still shop based on price. Progressive’s premium growth in recent years has been driven by the direct channel. In 2015, 47 percent of total personal lines premium volume was attributed to the direct channel with the remainder coming from agencies. In 2005, only 34 percent of total personal lines premium volume came from the direct channel. During this period, the agency channel had annualized compound premium growth of only 1.3 percent while the direct channel’s premium growth rate was 7.2 percent. The exhibit below presents the revenue breakdown for Progressive from 2005 to 2015 and illustrates the importance of growth in the direct channel (figures in millions; click on the image for a larger view). Progressive has been able to grow direct volume with consistent profitability with the combined ratio for the channel achieving an average over this period of 92.4 compared to 92.8 for the agency channel, which is roughly equivalent. The exhibit below shows Progressive’s combined ratio for each segment as well as the overall total. We can see that Progressive has demonstrated a long record of consistent underwriting profitability over time (click on the image for a larger view). A closer reading of the market share data above indicates that one must consider GEICO to be Progressive’s most important competitor. GEICO has grown at a more rapid pace than Progressive in recent years and has surpassed Allstate to become the second largest auto insurer in the United States. Berkshire Hathaway has been particularly aggressive when it comes to marketing and the direct channel approach has given GEICO a competitive cost advantage that has allowed for aggressive marketing. The exhibit below compares important statistics for GEICO and Progressive over the past seventeen years. We can see that GEICO generally runs at a higher loss ratio and at a lower expense ratio compared to Progressive. In most years, GEICO operates at a combined ratio that is somewhat higher than Progressive because the higher loss ratio is not usually fully offset by the expense ratio advantage. From reading Berkshire Hathaway annual reports over a long period of time, one can conclude that GEICO has a philosophy of very aggressive marketing in order to build share over time. This is reflected in the higher expense ratio. The marketing exposure, coupled with GEICO’s apparent willingness to accept a higher overall combined ratio has resulted in rapid growth. Warren Buffett observed in his 2015 letter to Berkshire Hathaway shareholders that State Farm is still far ahead of GEICO in auto insurance market share but that GEICO is gaining ground. This has certainly been the case over the past five years, as shown in the market share data above. Mr. Buffett went on to say that he hopes to announce that GEICO has taken the top spot by 2030, his 100th birthday. This might have been meant as a bit of humor but the reality is that GEICO has proven to be a formidable competitor and could very well dominate the auto insurance market fifteen to twenty years from now. What does this mean for Progressive? Obviously, GEICO is a formidable competitor and has achieved greater market share gains than Progressive in recent years, but this has come at the cost of lower aggregate underwriting profits over time as GEICO invests in heavy marketing to build brand awareness. GEICO has the advantage of having its policyholder float invested more aggressively than Progressive. Mr. Buffett and his top investment managers have skillfully managed policyholder float for decades. Although Berkshire manages insurance underwriting and investing separately, the greater utilization of float could very well make the economics of accepting lower underwriting profits in exchange for higher growth more palatable. Progressive has a more conservative investing philosophy with only a small equity portfolio that is mostly tied to an unmanaged index. As a result, Progressive’s management may be more inclined to manage the company for greater underwriting profitability than GEICO. This has certainly been the case in recent years. Because Progressive is at a disadvantage compared to GEICO when it comes to expenses, maintaining higher underwriting profits is likely to come at the expense of slower growth. 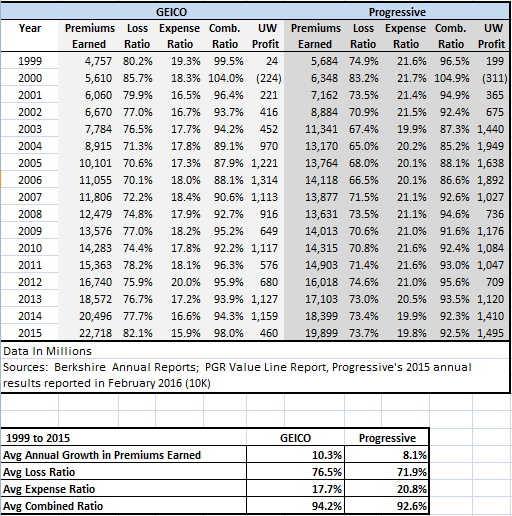 Progressive could very well continue to grow at a rapid clip over time while GEICO grows even more quickly. In fact, this seems like the most likely outcome over the next decade. Disclosure: Individuals associated with The Rational Walk LLC own shares of Berkshire Hathaway. No position in Progressive.